People and organisations from across EU came to Parliament on 9 October for the Citizen's Prize award ceremony in recognition of their contributions to Europe. 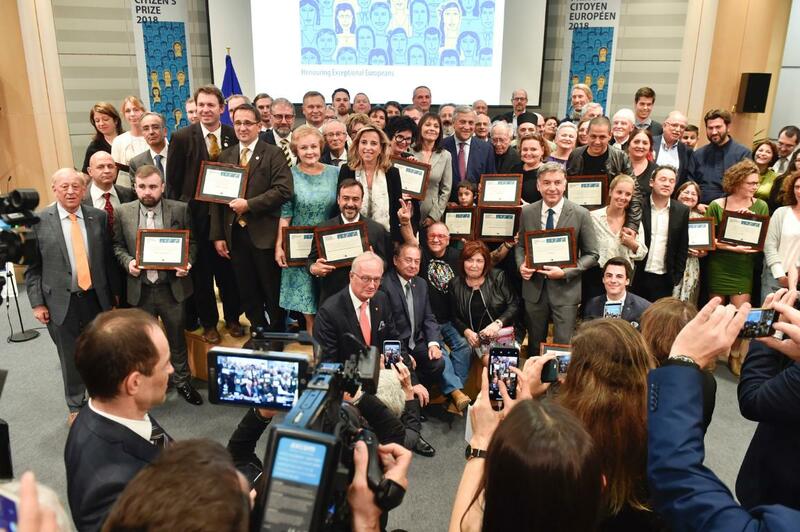 The European Citizen's Prize is given every year to projects and initiatives that contribute to European cooperation and the promotion of common values. After having received medals in ceremonies in their own countries, the laureates gathered in Brussels for a central award ceremony. Parliament Vice-President Sylvie Guillaume, a French member of the S&D group, said: "Helping the most vulnerable, fighting against discriminations, racism and hate speeches, defending intercultural dialogue, integration of migrants and refugees, campaigning for more tolerance, gender equality, involving young people on European projects, acting for freedom of speech. All these values are set out in the daily-life actions of the 50 persons or organisations that were chosen this year as the laureates for the 2018 edition of the European Citizen’s Prize. Our citizens have a voice, and this prize perfectly demonstrates that we are listening to them." This year’s winners include 50 people and organisations from 26 EU countries. Every Parliament member has the right to nominate one person or organisation for the prize and national juries made up of MEPs rank nominees from their country in order of preference. The final decision on laureates is taken by a central jury headed by Vice-President Guillaume.